A quick glance at the website VisitBalitmore.com shows a Baltimore skyline filled with shiny skyscrapers, new condos and the fancy Inner Harbor. Baltimore has more than 275 neighborhoods. Not all of them are shiny tourist attractions like the Inner Harbor. The reality for most of the city’s residents is, ‘where am I going to shop today?’ Edith Gilliard has been a resident of West Baltimore’s Franklin Square neighborhood for 43 years. She said she prefers to walk to a neighborhood store before getting in the car to go to the mall. On this springtime day she has traveled the short distance from her home to Hollins Market. On this weekday afternoon, Gilliard is part of a small group of people shopping in the Hollins Market neighborhood of Baltimore. She is eating lunch at Zella’s Pizzeria, one of a growing number of businesses nestled around the neighborhood’s namesake marketplace. Most of the businesses are black-owned, including New Beginnings Unisex Barbershop, Lemonlos barbershop, City of Gods Shop (a boutique) and the Independence Foundation (a psychiatric rehabilitation center). Today’s art show features the work of Jerrel Gibbs, who transforms traditionally white Charlie Brown characters into black men who are defying gender roles and fighting stereotypes. A small library of books are displayed on shelves behind a steel staircase that spirals to the upper level in barbershop. You can see this from the corner of Hollins Street where a vacant coffee shop is opposite to a sankofa art gallery . 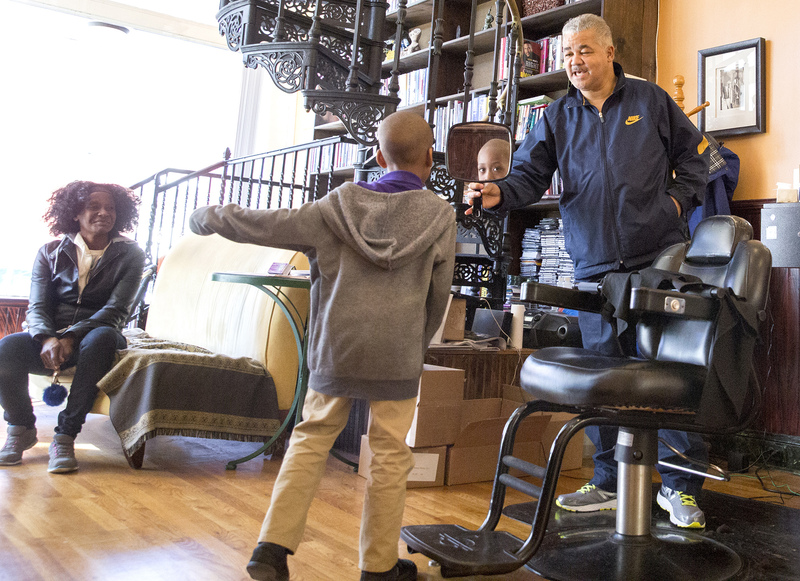 New Beginning’s barbers consider the library to be a powerful tool that can expose black youth in the community to black literature and black excellence. New Beginnings is a joint collaboration of three barbers, who originally worked at Lenny’s House of Naturals. The three barbers later moved to Salon 25 located near heavily traveled Baltimore Street until 2008, when they were displaced. 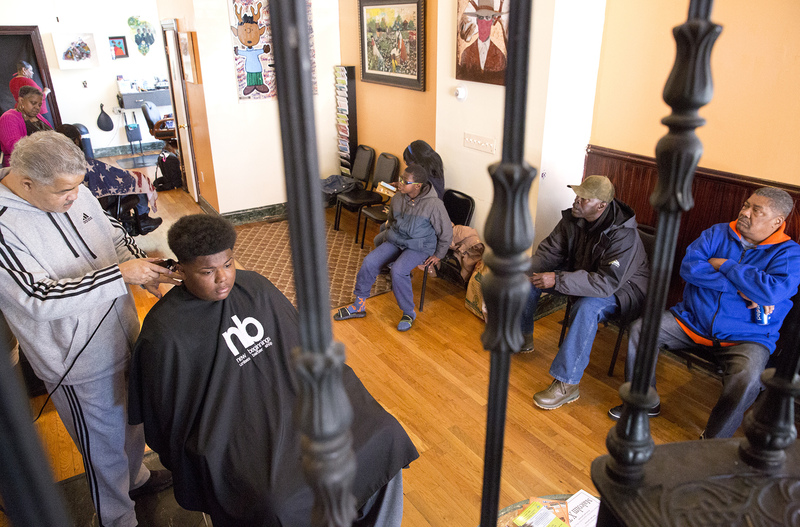 The University of Maryland wanted that land to build condos and housing, resulting in the barbers relocation a few blocks away to their current location on Hollins Street. Troy Staton is the barber who collects the artwork on the walls. His chair is at the back of the shop. Customers can see all the art on their journey back to his chair. He has lived in West Baltimore for 30 years. Staton has been cutting hair since he was a teenager. His said he had a good reputation as a barber, and that despite the threat of gang violence his talent was a passport to move freely around the city. He is the co-owner at New Beginnings barbershop, which remains a crossroads for black leaders, from city councilman to ministers. Staton said he is committed to outreach and mentoring young men in the same space where he does his barbering. He said he also aims to keep his neighborhood alert, heathy, and prepared for what’s in store to come. In the ebb and flow of conversation at his chair, Staton said he likes to make sure he is passing along accurate neighborhood news. “People see a change coming and voluntary relocate because of the lack of information and access to education, that is why spaces like the barbershop are so important,” Staton said. Ricky Phaison is the other co-owner of New Beginnings. He has been a resident of Edmonson village, located in Southwest Baltimore for 40 years. Phaison said he values the history Hollins Market represents. But he said he’d like to see it get major renovations. The neighborhood around the market needs some work too, Phaison said, including more businesses and healthy places to eat. “I am concerned about the area,” Phaison said. “There used to be a pawnshop, hardware store, and a bunch of boutiques”. New Beginnings plays an important role in the neighborhood because it is a family oriented business and serves as a center for community services, he said. For example, “we provide drug treatments and counseling for the community,” Phaison said. In February that meant New Beginnings partnering up with Kaiser Permanente to promote healthy living by providing free health screenings. The cultural role of the barbershop is reflected day-to-day in the art gallery. In August that role will be more prominent as New beginnings hosts its annual block party, which will have spoken word, music, a featured chef and, of course, haircuts. The third and only female barber, Ciara Daniels has almost 40 years of experience cutting hair. She said she has lived in Baltimore her whole life. Leslie Thomas, a customer of Daniels for 25 years, said she continues to support New Beginnings because she believes it is a family barber shop. 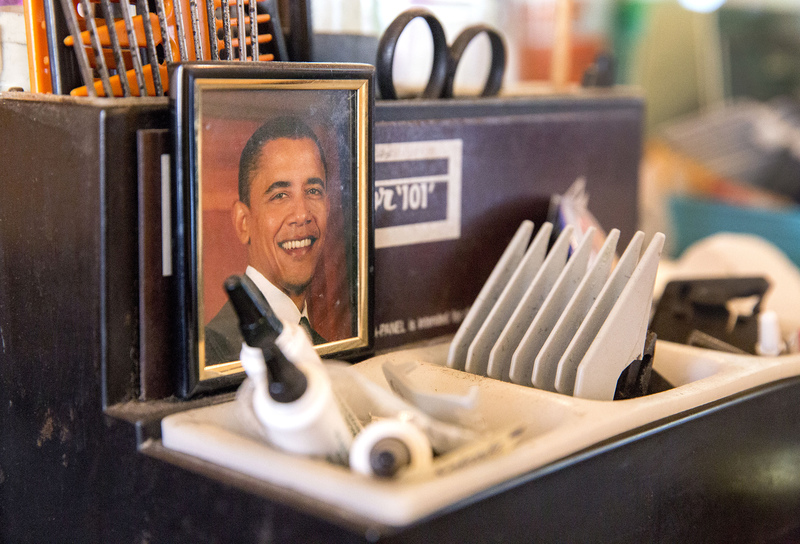 Less than a block away from New Beginnings is another barbershop with a different atmosphere. 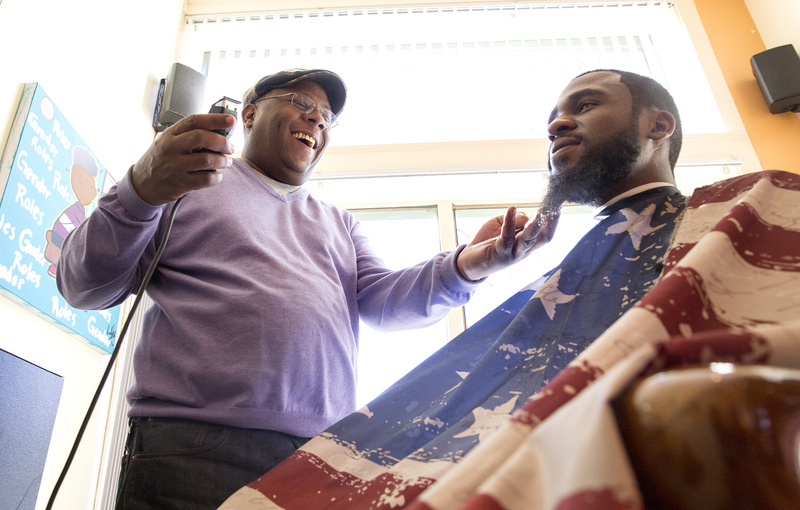 Rap music and sports talk fill the air in Lemonlos barbershop. Every chair has a customer in it and more than 10 people are waiting for their bi-weekly hair cut. There are six barbers in Lemonlos, all wearing blue uniforms. Under their blue coats they wear apparel from the black-owned boutique next door, City of the Gods. Dewayne Green who goes by Lemon, is the owner of Lemonlos barbershop, which celebrated six years in business this spring. Green is significantly younger than the owners of New Beginnings, which is reflected in the hip hop music on the speakers and the relative youth of his clientele. Despite those differences, Green said he still considers Lemonlos to be a trusted barbershop destination, where your barber is also your mentor and counselor. 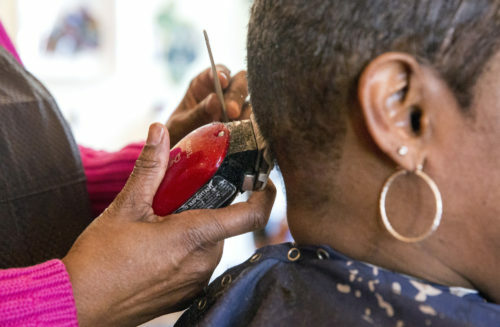 Black men crowd the barbershop Monday through Saturday to get their biweekly fix, a sharp fade. “It’s always crowded in here. On a Tuesday this barbershop is packed,” Green said. 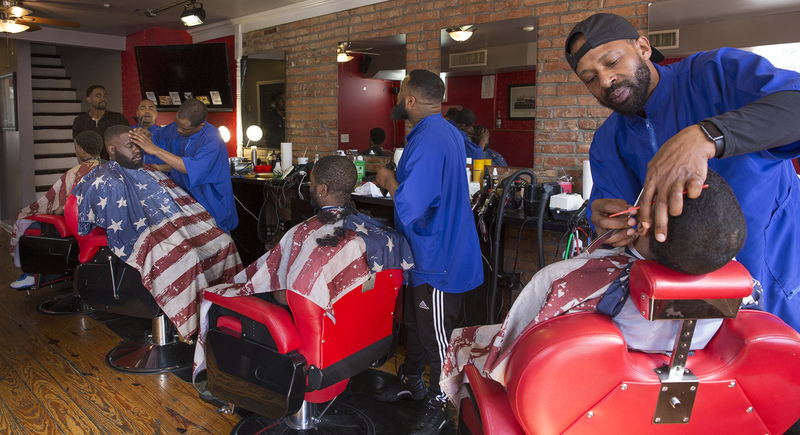 Kwame Rose, a frequent visitor and friend of Lemonlos barbershop,said the barbershop is a safe space for him, personally, and shows how black men intermingle. He said the barbershop is a vital business in the black community because it allows black men to escape the space where they are automatically labeled and stereotyped every day. “We are not what the media portrays us to be, just thugs and criminals, we leave all of that behind when we come here,” Rose said. Rose said black business owners are striving to make positive changes in the Hollins Market neighborhood. The owners of both New Beginnings and Lemonlos said their barbershops are community hubs, where real conversations occur. That opinion is echoed by Hakim Ali, Deputy executive director of the Independence Foundation, a licensed psychiatric rehabilitation program located in the Hollins Market neighborhood. The Independence Foundation provides case management for youth and adults in poverty. Ali said that in his experience average citizens are afraid to expose their lack of knowledge at community meetings, and cede control to the people who run the meetings. “Community meetings usually go the way the planner wants them to go,” Ali said. The director of the Independence Foundation said that is the problem. “It is the informal meeting place in the neighborhood where people can express their true opinions and frustrations,” Ali said. He said that leaders in the black community have long been aware of the power of using barbershops like Lemonlos and New Beginnings to gauge and influence neighborhood opinion. Micheal Seipp, who is a white man and executive director of Southwest Partnership, is utilizing the space as well. “The advantage of the barbershop is no formality. New Beginnings is a place for the Southwest Partnership to discuss what’s going on and get honest feedback form the community,” Seipp said. The Southwest Partnership is a made up of seven neighborhoods and six institutions that came together in 2013 with a vision of what the Hollins Roundhouse community had the potential to be. Seipp said that the ability to envision what your neighborhood will be like in 20 years is hard to manage. “Its how you deal with the evolution of the neighborhood that’s either good or bad,” Seipp said. The hot conversation this spring at both barbershops and at the more formal community agencies is the question of what impact developer Scott Plank will make in the neighborhood. Plank is the brother of Kevin Plank, the CEO of Baltimore-based Under Armor. Scott Plank has reportedly purchased 30 properties in the Hollins Market neighborhood. As customers settle in for haircuts at Lemonlos and New Beginnings, they are listening to see what their barbers have to say.